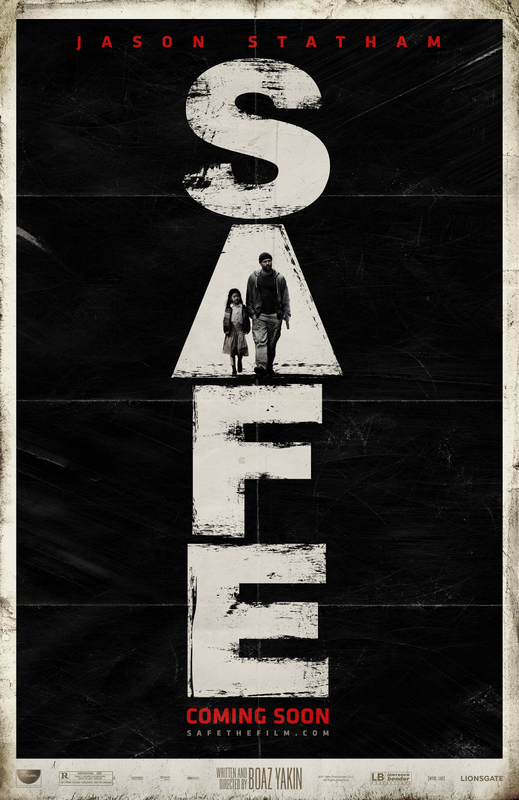 Considering this together with the poster for Contagion that was released a while ago we can already see the cool new trend: Posters with a weathered look that are mostly taken by the title, displayed vertically. Hott. Honestly, I like both posters, probably because I’m just a sucker for a weathered, beaten down look (remember how much fun I had with Grindhouse posters?). 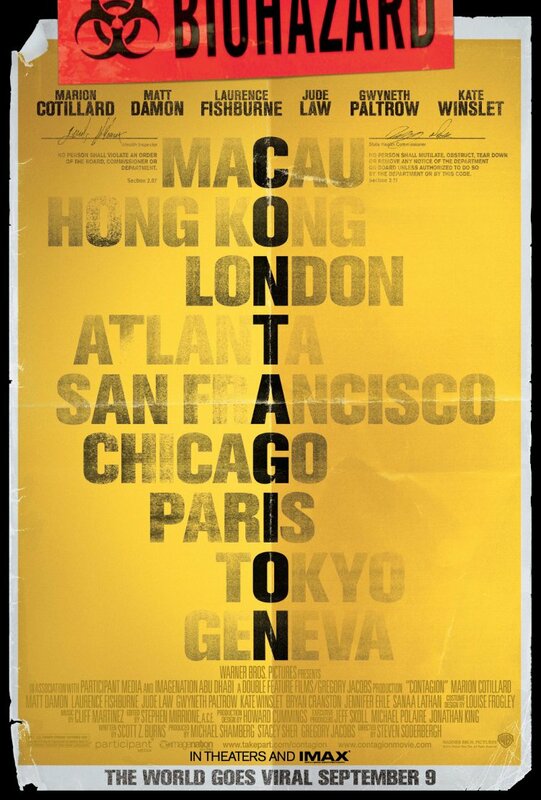 But the poster for contagion strikes me as the superior effort. 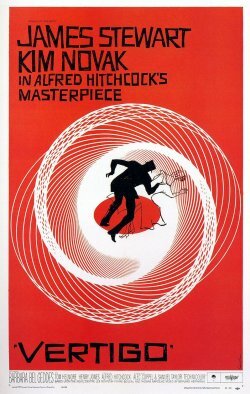 First, because the the choice of visual elements and iconography matches so well with the theme of the film. It complements the message, instead of being just something cool to look at. 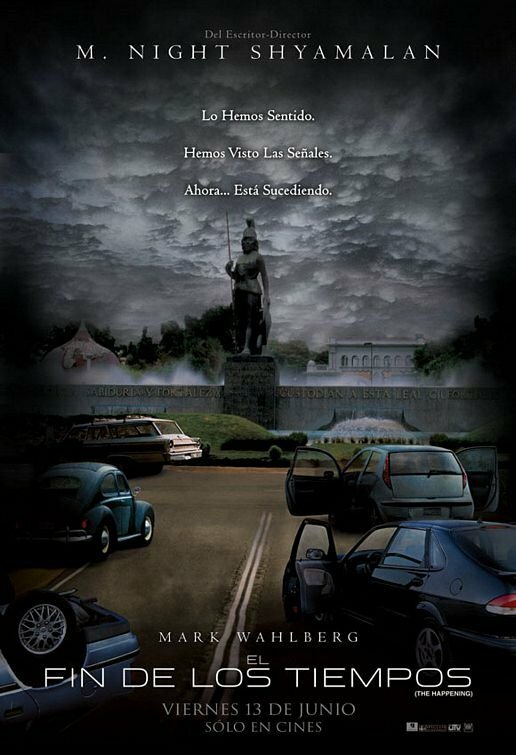 Second, because of it’s use of city names, a clever little way of conveying the huge scope of the disaster without relying on some epic images, which they might not have been able to get from the film itself. Again, looks good, but also tells me something about the story. The character posters, on the other hand, left me pretty cold. The tagline is great though. 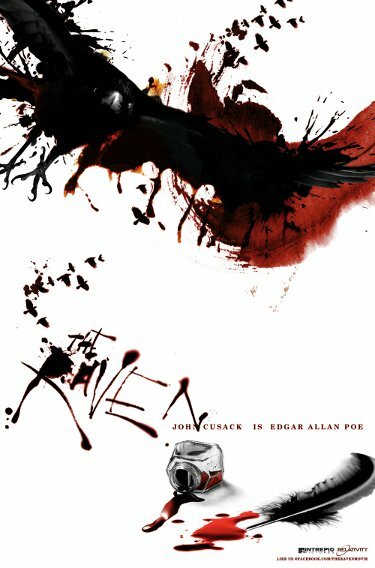 And talking about sure bets, here is a Comic Con poster for The Raven. Edgar Alan Poe + Comic Con = Awesome, right? Well, as it turns out, not for me. The image is not ugly, but it just hits no emotional notes for me. My own expectations might also be getting on the way in this case. I expected something dark and with an old time vibe. This is bright and feels weirdly modern. Just doesn’t feel right for me. This photo (I’ll update with a better picture when it comes out) of the teaser poster for Sherlock Holmes has me quite surprised. This is not how I expected Sherlock to look. There is a certain edge, a certain darkness I don’t generally imagine the character having. Then again maybe I just didn’t read the novels closely enough. Or don’t remember them well enough. Anyways, this is the very first poster, so a lot could happen with the campaign. 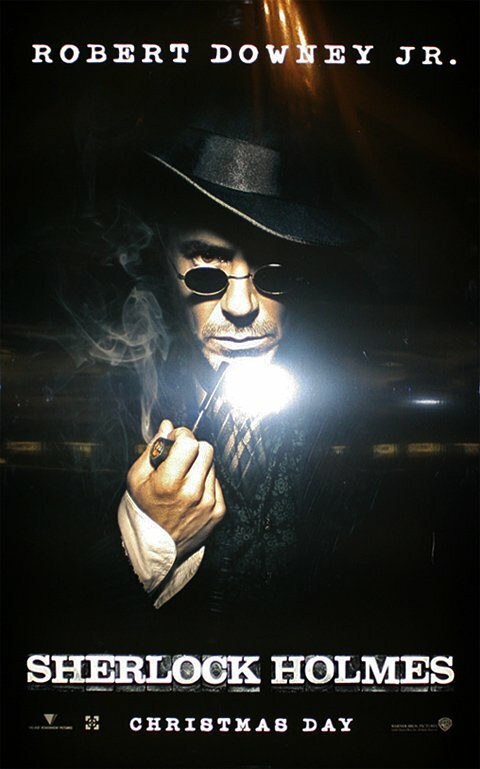 But right now the focus seems to be Robert Downey Jr. IS Sherlock Holmes. Which seems like fine pitch as far as I’m concerned. Several films have now been sold on top Johnny Depp playing an interesting character, and after Iron Man Downey seems to be inhabiting a similar position in the public’s consciousness. As a matter of fact I would love if more films were sold based on great actors delivering riveting performances. That would probably mean more good movies were being made. You can see some more ShoWest posters here, including many you have seen before, but now in the crappy photo version! Thanks to Philip for pointing this out. 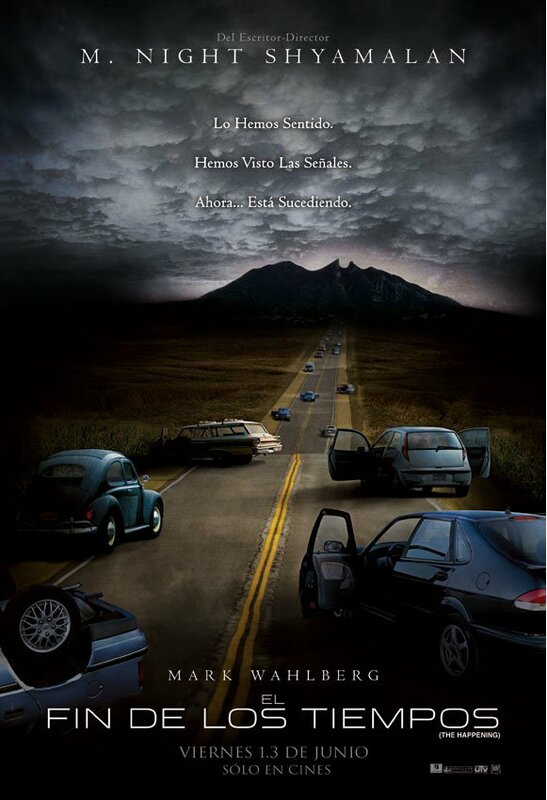 I’m starting to think that the people behind the marketing for The Happening want me to think about I Am Legend. As you might remember I Am Legend had several posters depicting cities around the world destroyed by the implacable virus. Pretty nice posters if you ask me. 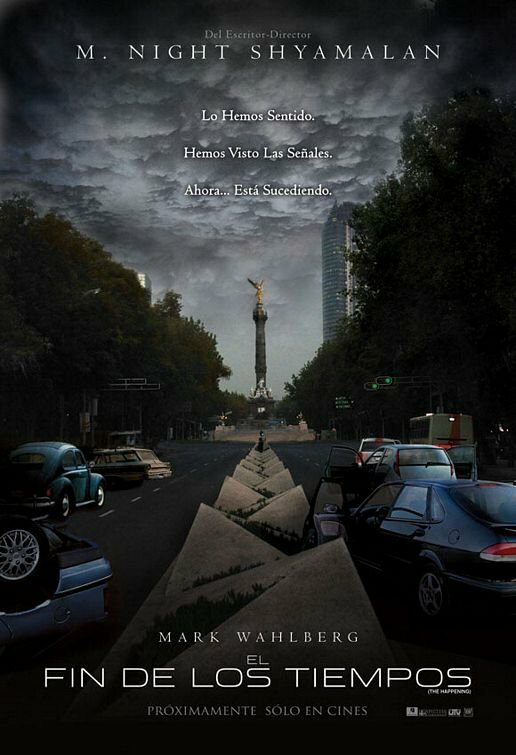 Well, know we have three posters for The Happening depicting different cities in Mexico that were apparently devastated by “The Happening”. Now, I don’t know if this is something that is being done only in Mexico, or if it’s a strategy they will use in other countries, but it sure is reminiscent of what they did for IAL. Of course, despite being cool they are not quite as well executed. In special the use of the very same abandoned cars in the three posters makes for an odd effect when you see them together. Then again maybe they are not intend to ever be in the same place in real life? The marketing pitch for The Happenning has been pretty clear from the get go. 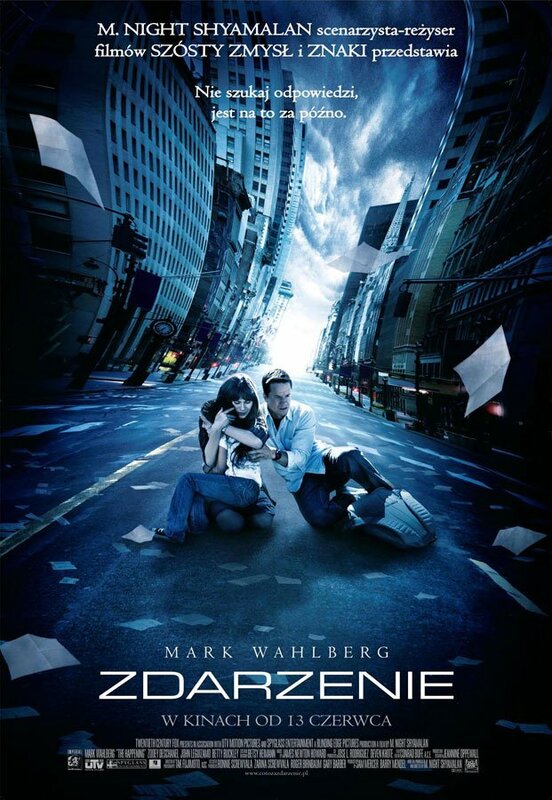 Creepy horror movie in which everybody dies mysteriously, leaving only a few people to deal with the aftermath. It’s not an exactly an unique premise, but it is one that has given us some strong stories, and it’s good hook to sell a film with. 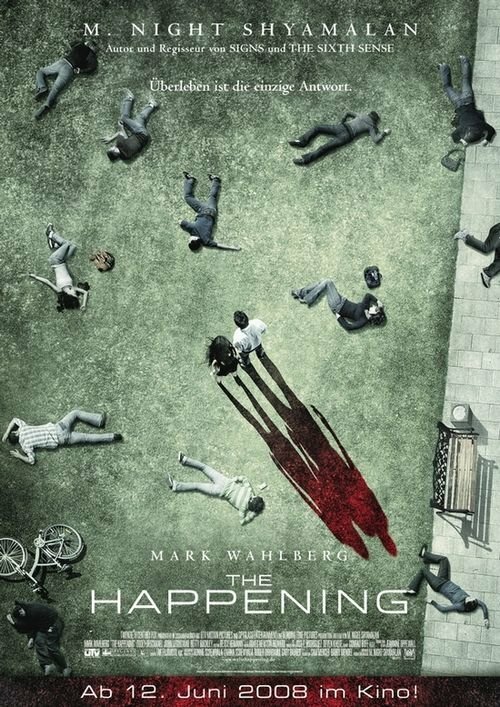 Today we have two posters for The Happening that reinforce that sell. The one above comes from Germany and it’s tightly connected to the imagery in the trailer. It’s also rather bloody, even tough no blood is actually shown. Instead of conveying the widespread plague by showing us empty streets it actually shows the bodies. That is a little unusual, and I think it makes for an upsetting image that manages to stand out. I do think, however, that the tight focus of the image, covering just a small portion of a park, takes away from some of the epic scope we have seen in other materials. From what we can see this could have easily been a minor disaster and not a world annihilating cataclysm. Then we have a polish poster that is at the same time more and less usual. The usual part is, of course, showing the barren streets of a big city, with just our heroes in the middle of it. Not that different from what we have seen in the marketing for I Am legend, although Smith was considerably more at ease in the posters for that film. The unusual part is the distortion of the image and all the paper flying around. So unusual that I’m wondering if it has some hidden meaning that is related to the story. The unusual side of this poster makes it stand out, but not in a good way. Catching people’s attention by being weird is not conductive to convincing them to see your movie. One interesting aspect of the poster is that it is the first one to focus clearly on there being a family at the center of the nightmare. It’s also the first to show Wahlberg. I have to say that the absence of these two aspects so far has been surprising, but not particularly bothersome.